JLT has done it again. Delivering a CAI performance intake for the 11-14 F150 5.0 that requires a tune and shows an improvement during dyno research and testing. (Even noticeable in super hot Florida conditions.) This intake kit has the MAF housing incorporated into the tube. This makes for a smooth interior and a smooth look to the tube itself. Another improvement worth noting is the sound. This intake is VERY LOUD. Immediately after installing this intake on our project Fleeterbomber F150 5.0 we could tell how good it sounds. 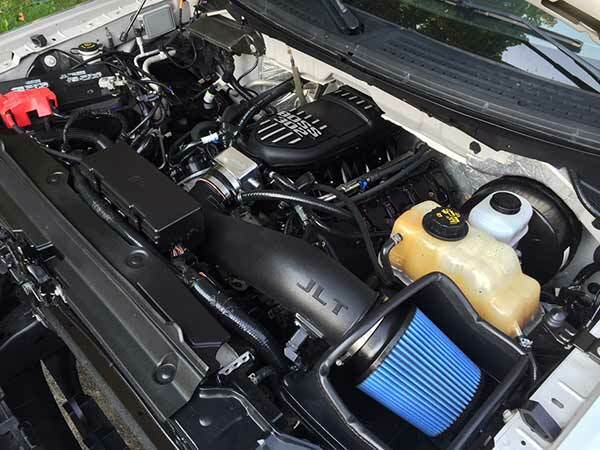 This F150 5.0 JLT CAI is a free flowing intake and the sound it makes is something that any performance enthusiast can appreciate. Plus, it fits great with the Boss 302 intake manifold. What more could you ask for? 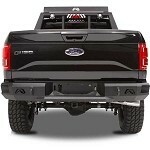 Read our Blog about the F150 JLT CAI install, dyno testing and review here. 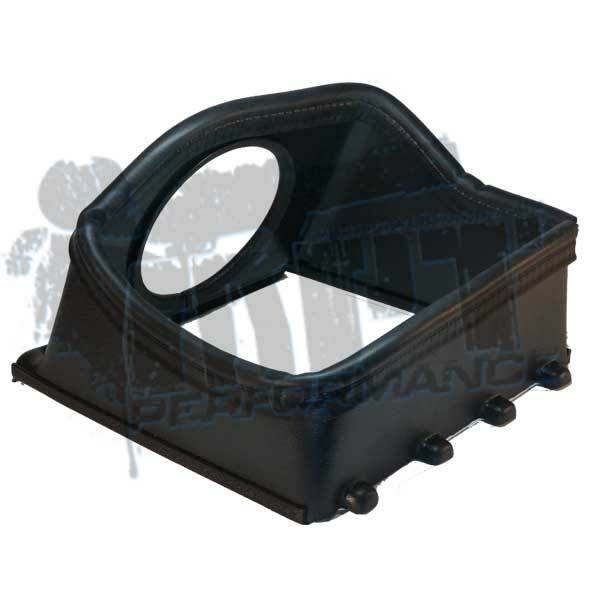 The heat shield ABS plastic to block engine heat at idle and low speed. 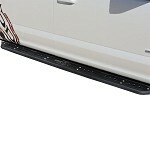 It incorporates the fresh air inlet from the grill. It uses a large area to make sure the filter has tons of cool air. 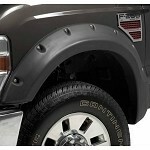 The MAF housing is larger than stock, which separates it from most all other F150 5.0 intakes. In general a "no tune required" intake means airflow didn't increase enough to require a tune update. This intake REQUIRES a tune update because the increase over stock is extreme. Check out the Power Gains tab above for dyno charts and results. 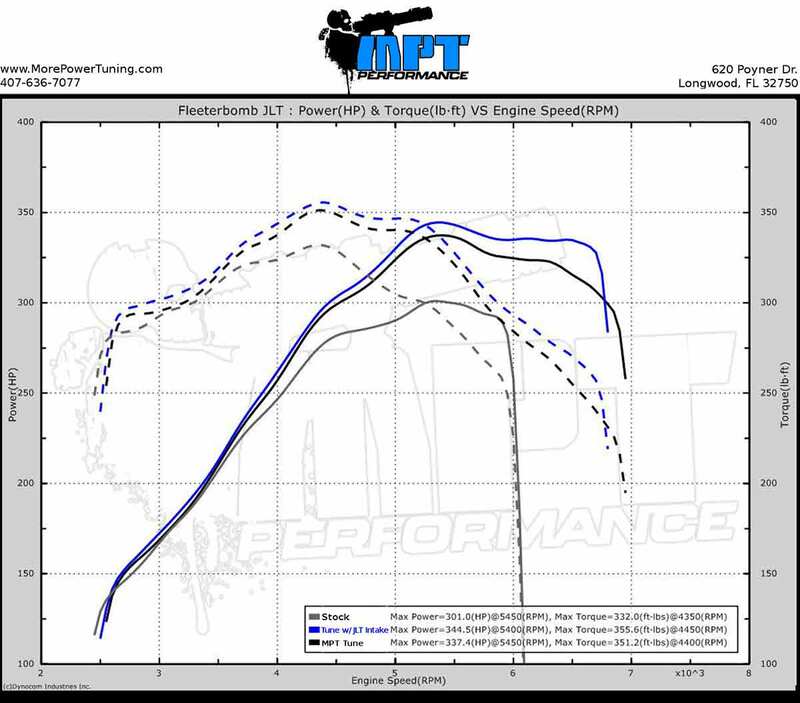 We saw an average of 10 hp increase and 10 ft-lbs increase during dyno testing from the JLT F150 5.0 CAI. That is on top of the already massive hp and tq increases from a tune. 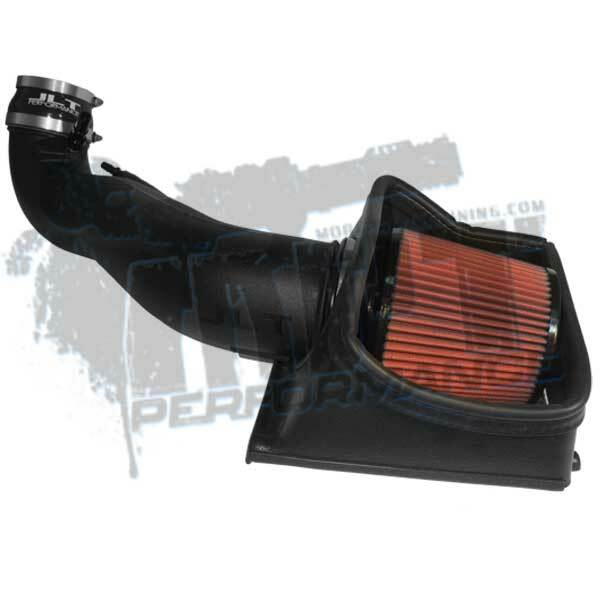 (TUNING IS REQUIRED) Another great feature of this intake is the aggressive sound it adds. Check out the video and blog for more info. To properly clean your oil filter, JLT recommends the S&B Precision II Cleaning & Oiling Kit. *TIP* by purchasing a 2nd air filter you can simply swap filters when it's time to clean it and not be rushed. Clean the first filter and it's ready when it's time to change again. JLT uses air filters made by S&B to their exact specifications. For years they only used oiled filters, but dry filter technology has been proven and is now a popular option. Since you are not sacrificing performance with either choice, the decision comes down to would you rather throw away the dry filter or clean the oiled one. Oil: Oiled filters can last forever as long as you properly clean and re-oil it. See picture of filters below. 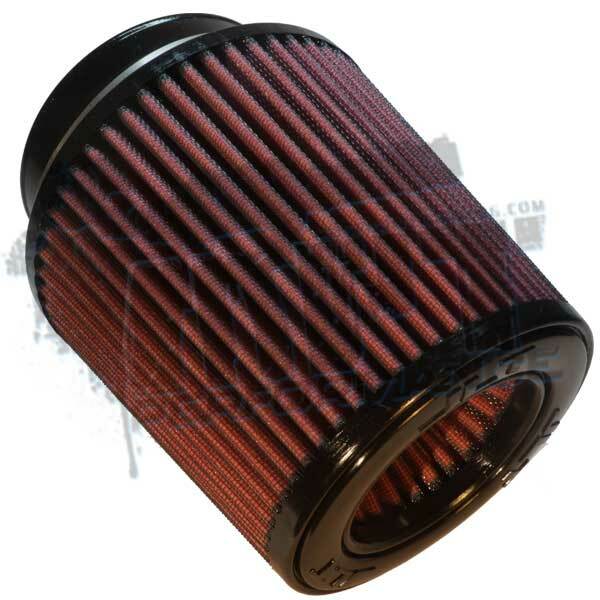 Oil filters are available in red or blue and Dry filters are white. Don't believe us when we say it connects to the Boss 302 intake manifold? Check out these pictures. 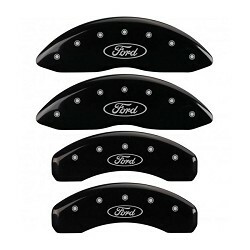 NOTE: Tuning of your vehicle is required with purchase of this intake. The massive diameter on this JLT intake makes it very LOUD. If you do not like a loud intake, this is not the CAI for you. This intake will exhibit a loud droning type noise at lower rpm when accelerating heavily, then watch out as the power kicks in and this intake really screams to life. The power gains are very noticeable for the enthusiast that enjoys a loud intake. This is the exact product I was looking for, looks mean! Sounds mean! And it installed in about 12 mins with ease. Re tuned my truck with the supplied updates to my existing MPT tunes and was on my way! Recommend this to anyone, and as always service was top notch! The absolute bomb. 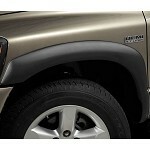 With full exhaust from motor to bumper, add this and you will be pleased hands down. 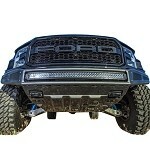 More air in with tune, more out, this mod let's me burn 33" nitro trail grapplers, nuff said. Ken will never loose my trust as a calibrator. Installed on my 2011 Platinum. Brother and I installed in about 15 minutes. The JTL CAI along with the 93 Performance Street Tune really woke my truck up. I recently installed the jlt cai on my 2013 f150 4x4 supercrew and have to say i love the performance increase, and also love the sound change. Gave the truck a throatier sound. I only had one issue that was addressed promptly. The filter element was rubbing the underside of my hood, spoke to jay at jlttruecoldair.com and he shipped me a new sheild, problem solved. Keep up the great work guys. 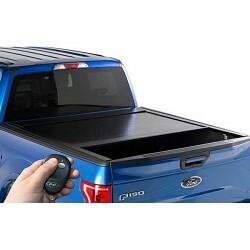 Scored this and got the tune updated from MPT for my F150 5.0 worth every penny and MPT tunes hands down! The JLT intake is very loud and flows a lot of air. We tried to start the truck up after install before the tune. The truck sputtered and died because of the amount of air flowing. When you get on the throttle you really notice how loud it is. It is the loudest intake I have ever had on a vehicle. I had previously always used K&N cold air intakes. Very loud. One thing I noticed is that the truck can finally breath. Throttle seemed to quicken up as well. 10/10 would buy again. The JLT CAI is awesome. Sounds amazing when you step on it, but yet quiet when you're cruising. It looks clean underneath the hood. Very easy to install. Q: i see you guys say this will fit the boss 302 manifold, but i see in the pics the throttle body isnt stock and looks like the ford racing 90MM TB. if i have my stock TB on will this intake still fit? A: This intake will fit a stock throttle body as well. Q: I purchased this intake for my 2013 f150 as well as the SCT tuner I was wondering if they'll work on a 2016 if I upgrade trucks? 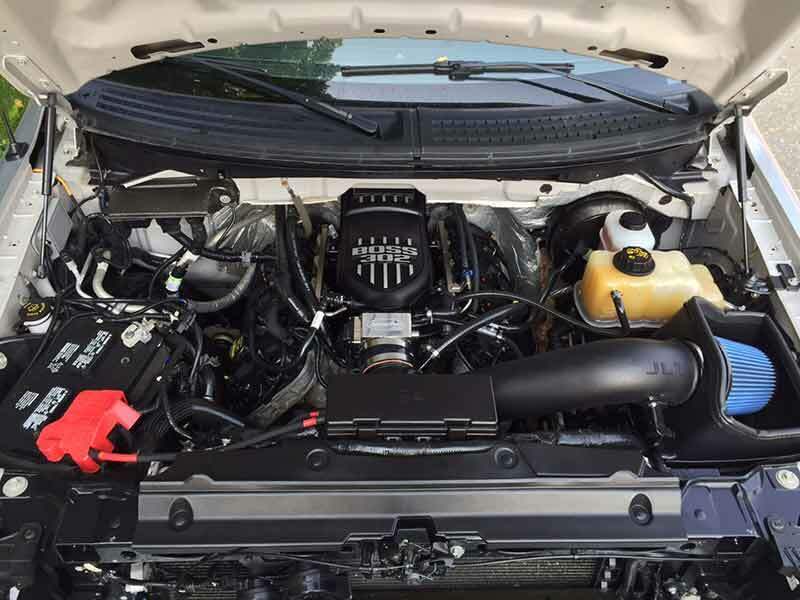 A: The SCT would be compatible with a 2016 model, but the JLT intake would not. 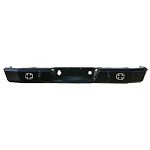 The intake for the 2015-2016 models is a different part number. Q: I already have 3 custom tunes with MPT, How do I add/receive the update for this CAI? And, can I get all 3 tunes updated? A: After making the purchase, just submit a custom tune form telling what has changed and the invoice number for the purchase. BUying it from us will get you a free tune update and it will cover all 3 tunes.